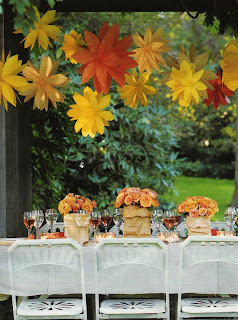 I'm thinking summer again....just dreaming.... but daylight savings time is just around the corner. So summer is close behind! Yeah!!!! This recipe is from Pampered Chef. Use any kind of fruit you want and just add the dip. It's creamy and has just enough sweetness to it to make the fruit taste yummy! Zest orange with Lemon Zester. Finely chop zest to measure 2 tsps. Combine sour cream, preserves and orange zest. Fold in whipped topping until combined. Cover and refrigerate until ready to serve. I love working with chicken. It's lower in calories and better for you than beef. This recipe is easy, easy, easy. You can save it for that special occasion, or as a week night treat. 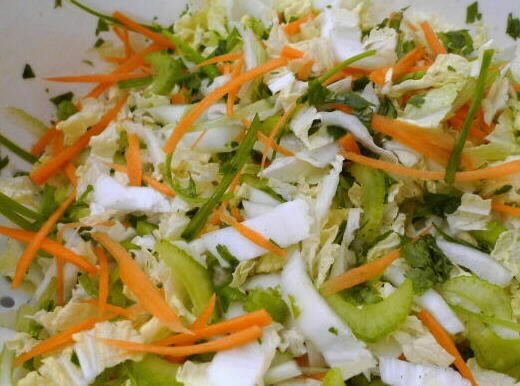 Add the vegetable of your choice, a light salad and either rice pilaf or baby reds and you have a wonderful meal. If you have never flattened chicken for a recipe like this, see my recipe for Chicken Marsala on this blog. There's a short video showing you exactly how to get those chicken breasts nice and flat. Instructions:1. Season cutlets with salt and pepper, then dredge in flour. Coat a saute pan with nonstick spray, add oil, and heat over medium-high. 2. Saute cutlets 2-3 minutes on one side. Flip cutlets over and saute the other side, covered, 1-2 minutes. Transfer cutlets to a warmed platter; pour off fat from the pan. 3. Deglaze pan with wine and add minced garlic. Cook until garlic is slightly brown and liquid is nearly evaporated, about 2 minutes. 4. Add broth, lemon juice, and capers. Return cutlets to pan and cook on each side for 1 minute. Transfer cutlets to warm plates. 5. Finish sauce with butter and lemons. Once butter melts, pour sauce over cutlets. 6. Garnish with chopped fresh parsley and serve immediately. This recipe is just plain "sinful".... LOL!.... 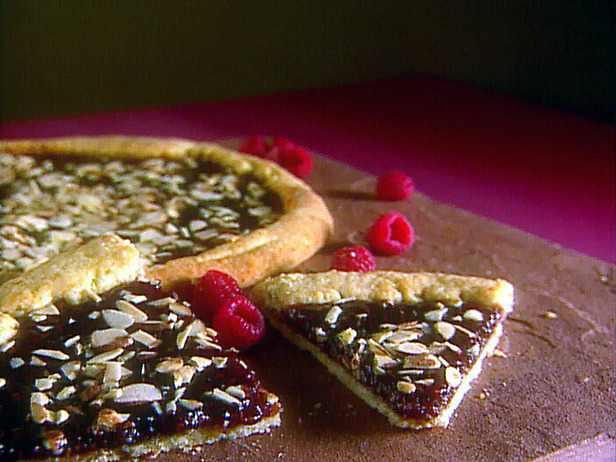 but if you have a sweet tooth, this will curb that craving for a good long time. 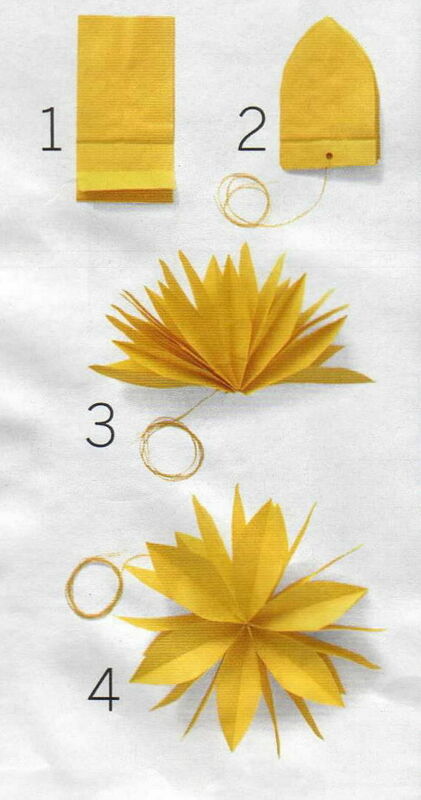 I found this in Family Circle magazine (January 2009). I told you I cut out everything. I feel sorry for my kids when I go to that big kitchen in the sky. They will have enough recipes to last a lifetime.The good thing is I'm a pretty organized lady. All recipes are categorized in file folders in my desk. Actually they will probably have a great time going through all of them. Anyways, back to the recipe. 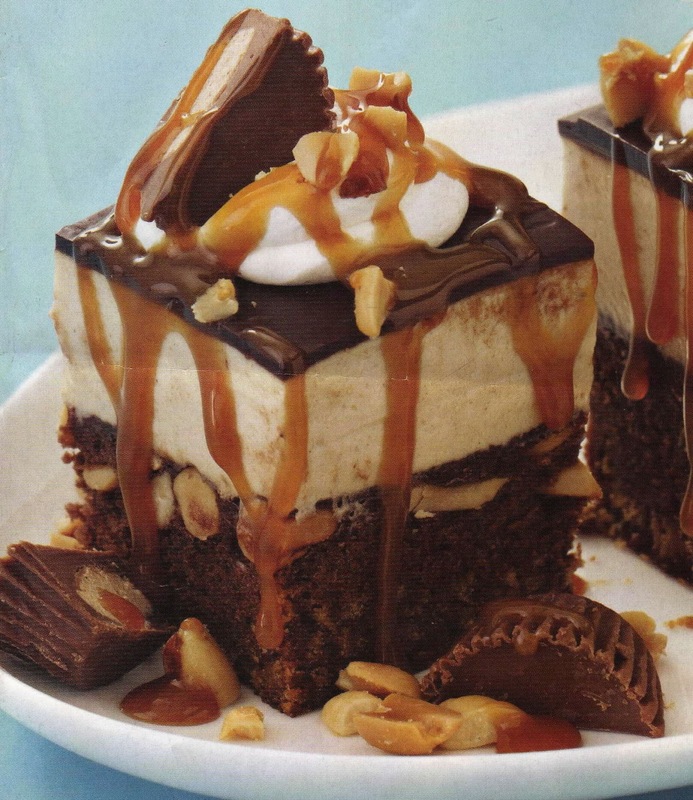 If you love chocolate and peanut butter and nuts and peanut butter cups and caramel sauce this one is for you. It's pretty rich, so a little goes a long way. But for that special occasion, this one is a winner. Enjoy!!! Heat oven to 350 degrees. Spray a 9 inch square baking pan with nonstick cooking spray. Line pan with foil, allowing sides to overhand; spray foil. In small bowl, combine graham cracker crumbs and granulated sugar. Mix in melted butter. Press crumb mixture into prepared pan. Bake until golden, about 5 to 7 minutes. Cool in wire rack. Prepare brownie mix according to package directions for cakelike brownies (adding 1/4 c. water, 1/3 c. oil and 3 eggs. Fold in chopped nuts. Pour batter into crust-lined pan. Return to 350 degree oven; bake until brownie is just set and toothpick inserted in center comes out clean, 30 to 35 minutes. Cool completely in pan on wire rack. With electric mixer in medium bowl, beat cream cheese until smooth. Add peanut butter and confectioners' sugar; beat until just blended (it will look lumpy). Add milk; beat lightly to loosen mixture. In separate bowl, whip 1 cup of the cream and gently fold into peanut butter mixture. Spread mousse evenly over cooled brownie. Refrigerate 1 hour. Heat remaining 1/2 c. cream in a small saucepan over medium heat until just boiling. Remove from heat; add corn syrup and chocolate chips. Cover and let stand 5 minutes. Stir until smooth. Pour glaze over chilled mousse and spread to cover completely. Return to refrigerator for at least 1 hour. Run a small knife around inside of pan and lift out brownie. Heat knife under hot running water and trim edges. Slice brownie, rinsing knife after each cut, into 5 strips and 1 1/2 inches wide. Cut each strip into 5 pieces about 1 1/2 inches square. Transfer to a serving plate and garnish with whipped cream, nuts, candy and caramel sauce. I love Greek flavors. They love using olive oil and lots of lemon juice. Of course it wouldn't be perfect without "garlic"! 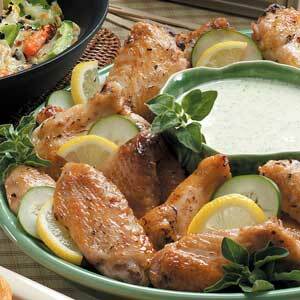 These wings are wonderful alone, but with the cucumber dipping sauce makes them FABULOUS! toss to coat. Refrigerate overnight. Drain and discard marinade. 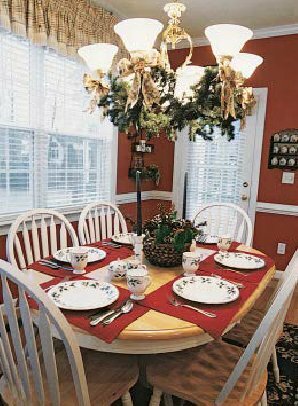 Place wings on a rack in a greased 15-in. 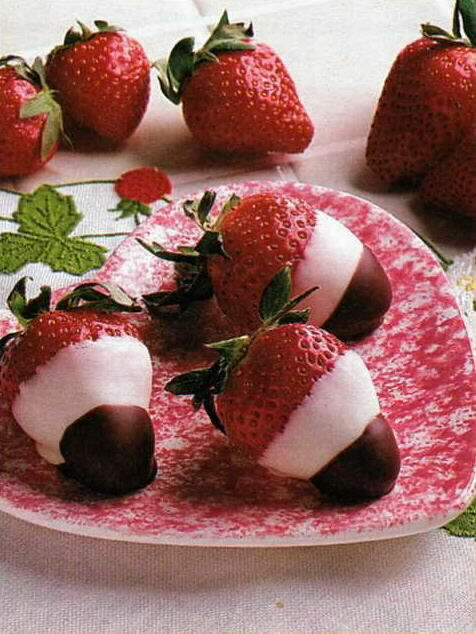 I must be thinking about summer today...I love fresh strawberries and when they're dipped.... OMG.... a great little idea for a baby or wedding shower. There's nothing better than chocolate and strawberries... my mouth is watering right now. until set. Yield: 2-1/2 dozen. Position the rack in the center of the oven and preheat the oven to 400 degrees F. Roll out the dough on a floured surface to an 11-inch round. Transfer the dough onto a heavy baking sheet that has been lined with a silpate or parchment paper. 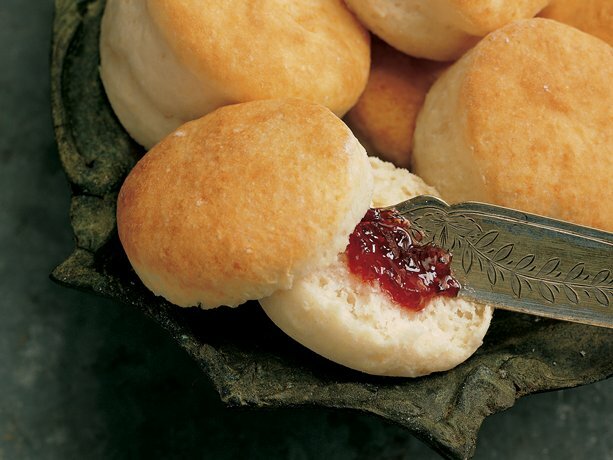 Stir the lemon juice into the preserve and spread the preserves on top of dough, leaving a 2-inch border. Fold the dough border over the filling to form an 8-inch round, pleating loosely and pinching to seal any cracks in the dough. 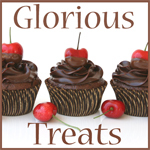 Hi everyone...busy week and not able to post any new recipes or crafty things. I hope you enjoy this recipe. It is easy and tastes wonderful....These wonderful biscuits are from our dear friends at Betty Crocker. They are light and creamy and with a little jam or butter they are a great compliment to any meal. Disolve yeast in warm water in medium bowl. Stir in sugar. Stir in baking mix and half-and-half until dough forms. Turn dough onto surface generously dusted with baking mix; gently roll in baking mix to coat. Shap into ball; knead 10 times. Roll 1/2 inch thick. Cut with 2-inch cutter dipped in baking mix. Place on ungreased cookie sheet. Cover and let rise in warm place about 30 minutes or until soft and puffed. Heat oven to 425 degrees. Bake 6 to 8 minutes or until golden brown. Serve warm. 12 biscuits. I guess tonight I'm into salsas, and dips....I think I'm craving veggies and fruits...this dip is an old time favorite. It works great for home get-togethers, BBQ's and just about any event where you need a quick dip. I haven't met anyone who can turn this one down! Mix beans and taco seasoning mix. Spread onto bottom of 9-inch pie plate or quiche dish. Layer all remaining ingredients except chips over bean mixture; cover. Refrigerate several hours or until chilled. 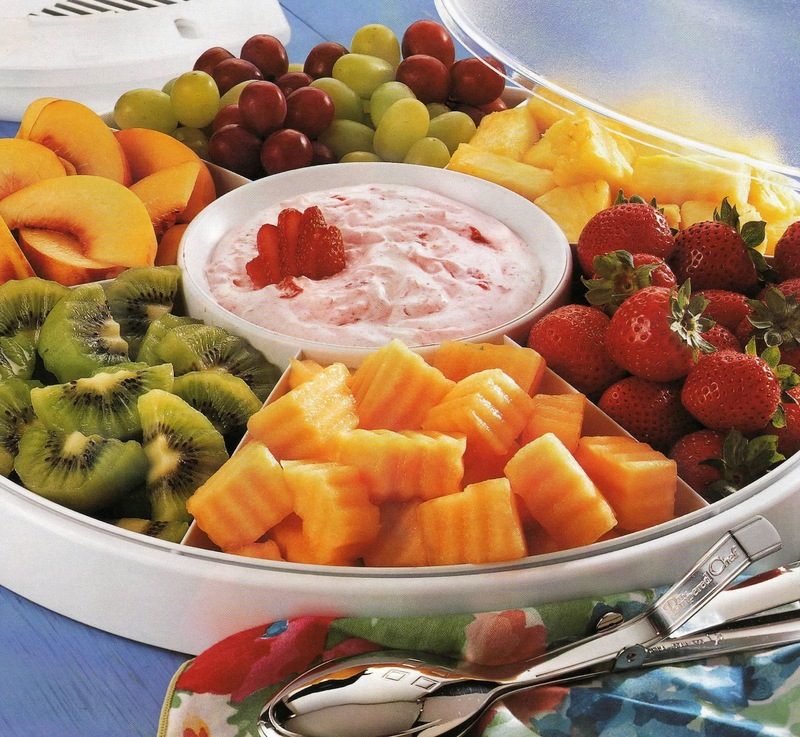 Dip can be stored, tightly covered, in the refrigerator up to 2 days. What a fresh idea. A little tart, a little heat and everyone's favorite cilantro. How could you go wrong. Use as a compliment to chicken or fish or a dip for tortilla chips.... yummmy! 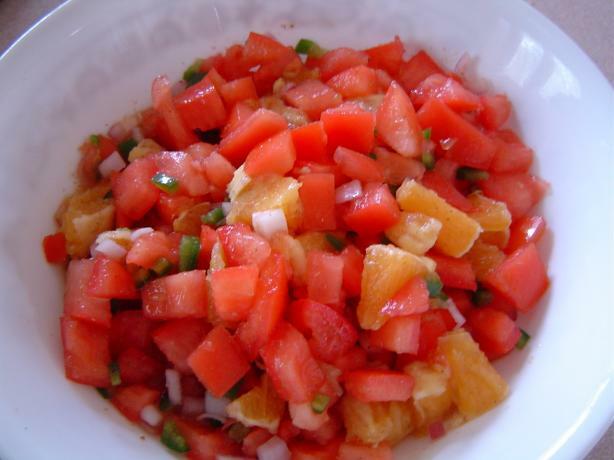 Combine Sunkist fresh diced orange segments, tomatoes, red onions, jalapeño, cilantro and salt. Toss gently to mix thoroughly. 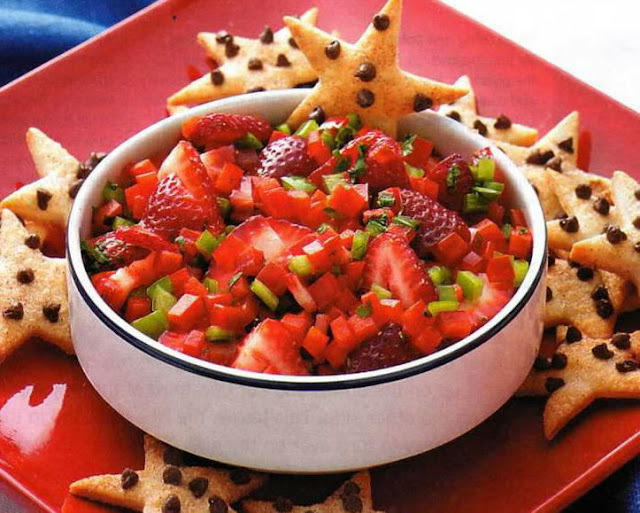 Strawberry Salsa.....what a yummy idea. 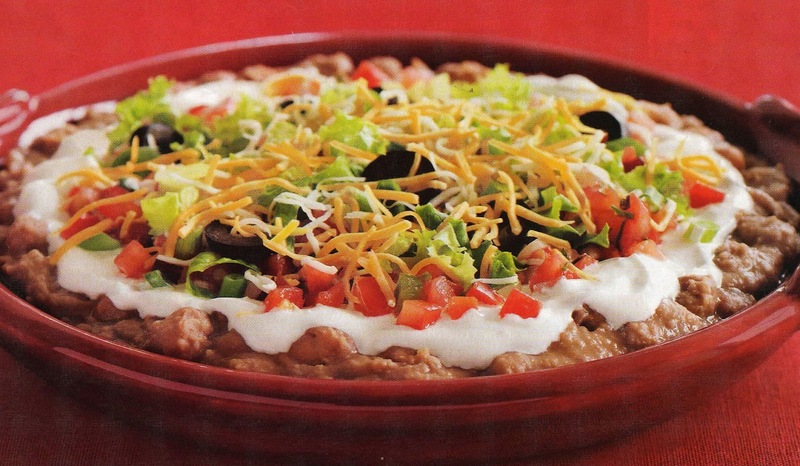 Our friends at Taste of Home shared this recipe in their July/August 2008 issue. Can be used on fish, chicken and tortilla chips. In a large bowl, combine the strawberries, green pepper, onions and parsley. Stir in the salad dressing, hot pepper sauce and pepper. Cover and refrigerate for 2 hours. Serve with tortilla chips. Yield: 3 cups. I'm always clipping, tearing, cutting articles and pictures of things that interest me. I absolutely love this quilt and the bed pillows. 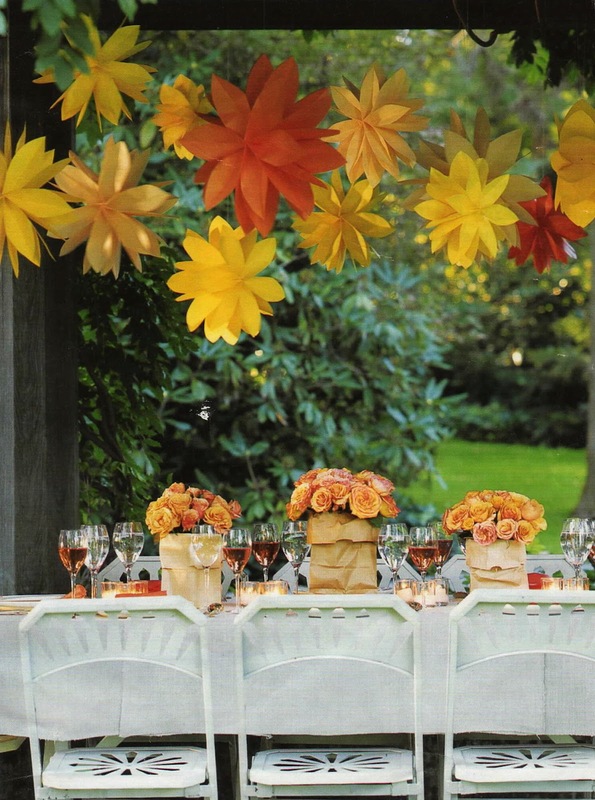 The stripes and the solids against the backdrop of white and yellow make it so pretty. 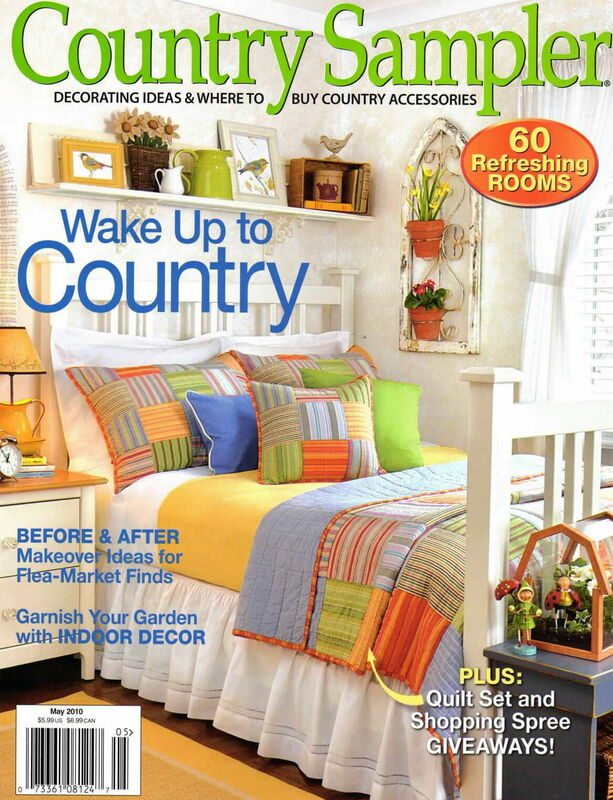 The picture is from Country Sampler (May 2010). All Country Sampler back issues are available on their website. 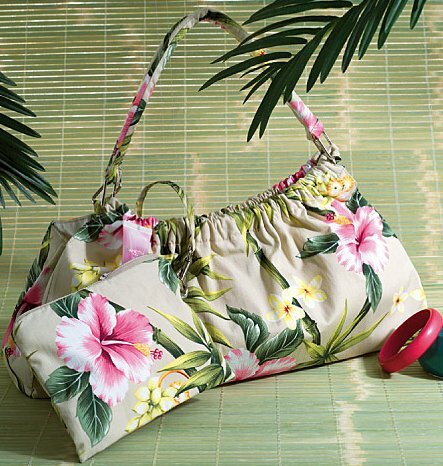 What a cute purse for summer...just think summer is right around the corner. We have had a beautiful winter this year in the northland. Very litte snow and great temperatures. This bag cold be whipped up in no time for that summer wedding or just for the fun of making it. Bright colors and patterns would make this a special addition to your purse collection. 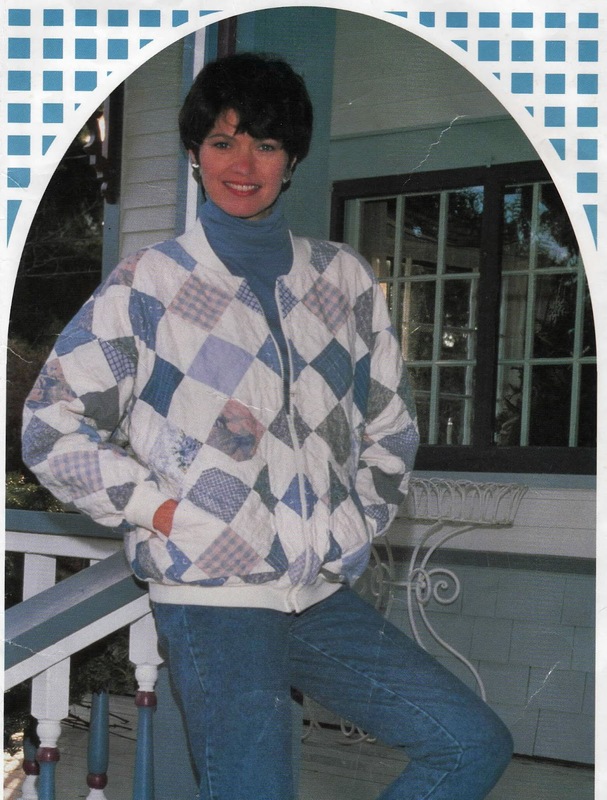 This is an oldy, but goodie....for those quilters in the group, this is a very cute in-between jacket. I made mine using different patterns of black and white. It turned out very cute and have worn it forever. Simple instructions for this one! 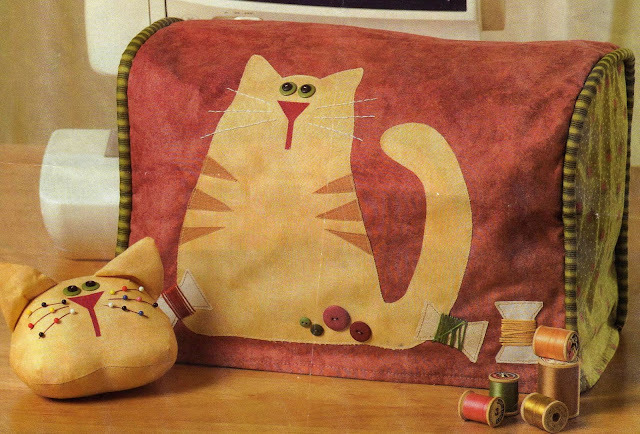 Back Porch Press has other very cute quilting patterns. 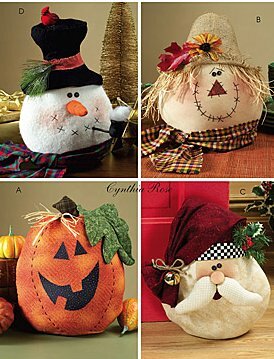 HOLIDAY DECORATIONS: Package includes patterns and instructions for pumpkin A, scarecrow B, santa C and snowman D; all views are approximately 11" W x 14" H and have contrast sections. NOTIONS: Thread; Pumpkin A - One Skein of Embroidery Floss, Glue Gun, Raffia, Doll Beads and Polyester Fiberfill; Scarecrow B -Two 3/8" Buttons for Eyes, One Skein of Embroidery Floss, One Silk Leaf and Flower, Glue Gun, Raffia, Doll Beads, Powder Blush and Polyester Fiberfill; Santa C - One 11/4" Button To Cover, Two 3/8" Buttons for Eyes, 1/2 Yd. of Twine, One 11/4" Jingle Bell, Glue Gun, Holly Spray, Raffia, Doll Beads, Powder Blush and Polyester Fiberfill; Snowman D - Two 1/2" Buttons for Eyes, Embroidery Floss for Mouth and Nose, Glue Gun, Holly Spray, Bird, Pipe, Glitter, Doll Beads, Powder Blush and Polyester Fiberfill. Fabric Remnant, 14" x 81/2"
Fabric Remnant, 7" x 5"
Fabric Remnant, 7" x 31/2"
Fabric Remnant, 12" x 15"
Fabric Remnant, 41/2" x 21/2"
Fabric Remnant, 191/2" x 41/2"
Fabric Remnant, 7" x 6"
Fabric Remnant, 121/2" x 6"
Felt Remnant, 19" x 12"
Felt Remnant, 31/2" x 12"
Fabric Remnant, 21/2" x 12"
For those gals that love to work with sweatshirts....this is a must have. When my Mom was still alive, I would visit her in Duluth every other weekend. When I arrived, Sewing With Nancy was on her TV. Nancy has many techniques for the begnner and seasoned seamstress. I purchased this booklet from Sewing with Nancy after watching the sweatshirt makeover episode. 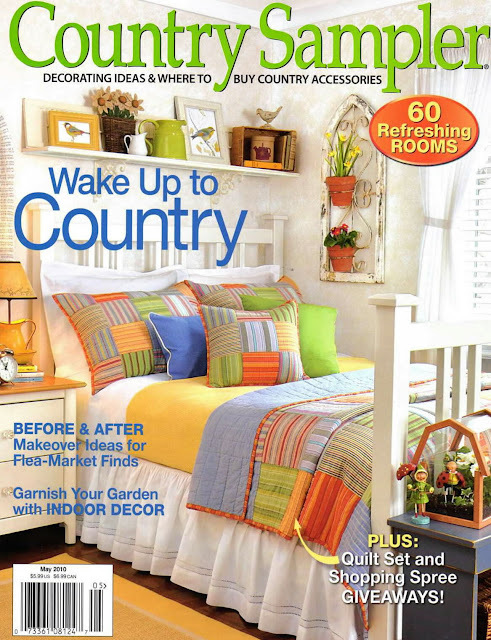 This publication can be purchased through Nancy's website. It also might still be available at a fabric store near you. 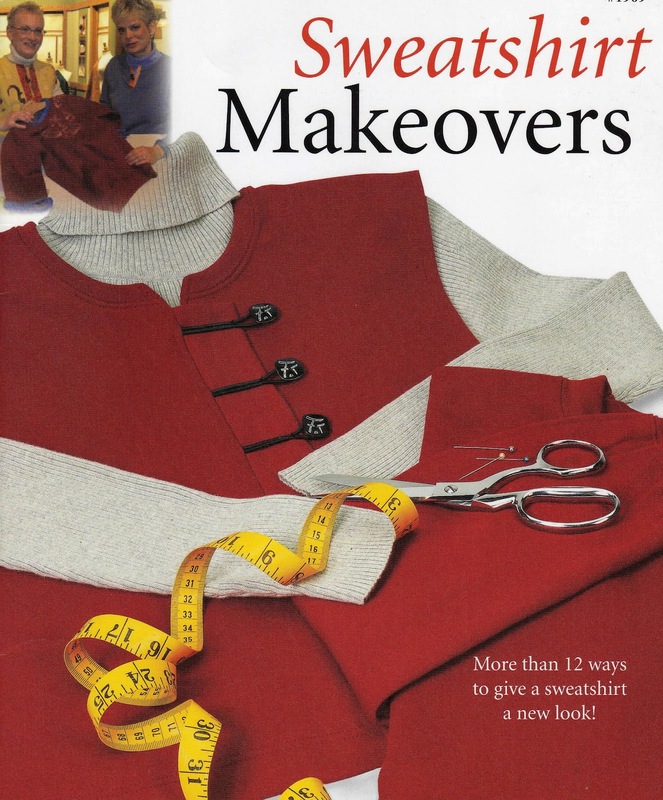 Also, I have included Nancy's episode on the sweatshirt makeovers.... I hope you find new and interesting ways of making over those always available sweatshirts. Over the years I have collected thousands of patterns that I think are cute. Because I love to sew, my sewing machine is always out. I found that if I put it away, I wouldn't sew anything because it was always a hassel to pull everything out over and over again. So now my sewing machine is a permanent fixture in my laundry room. When I get the urge, I remove the sewing machine cover and I'm ready to go. I thought this cover was a cute addition. The pattern can still be purchased through McCalls patterns at the link below. 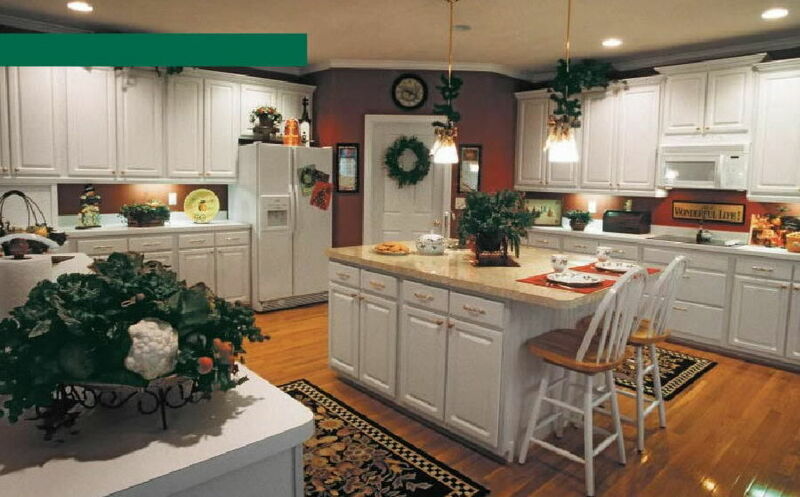 I love this kitchen... when I saw it in "Taste of Home" magazine, I cut it out. This was a holiday magazine, so there's a lot of holiday decorations. 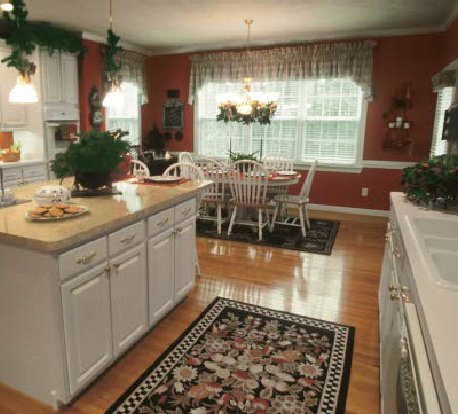 I don't need a kitchen quite this large, but the layout is wonderful. I love the color of the walls and the wood floor makes everything pop! 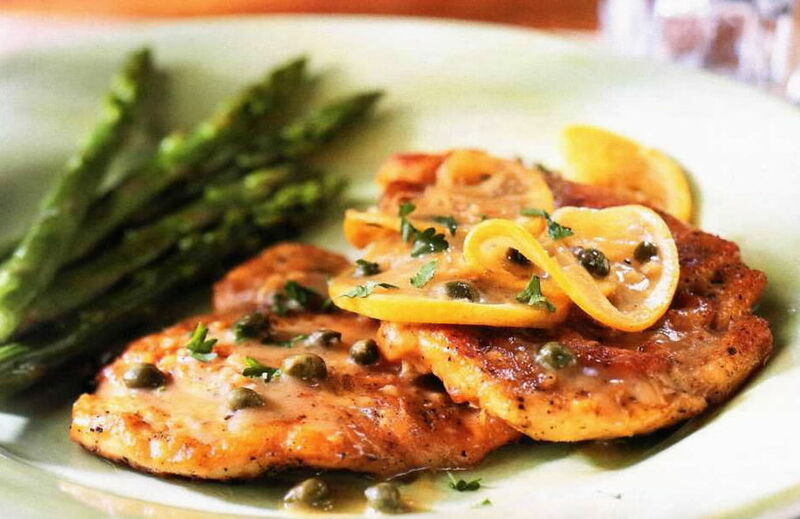 Dredge the chicken breasts in flour. Shake off the excess flour. Dissolve tomato paste in the Marsala wine. Heat butter and olive oil in a skillet and saute onion in the skillet. Add the floured chicken breasts to the skillet, and brown on both sides. Season with salt and pepper and pour the Marsala-and tomato-paste mixture over the chicen breasts. Remove the chicken breasts to a platter. Add butter, olive oil, and garlic clove to the pan. Add the mushrooms and saute for a few minutes. Pour in 1/4 cup Marsala wine. Salt and pepper to taste. Allow the mushrooms to absorb all the liquid. 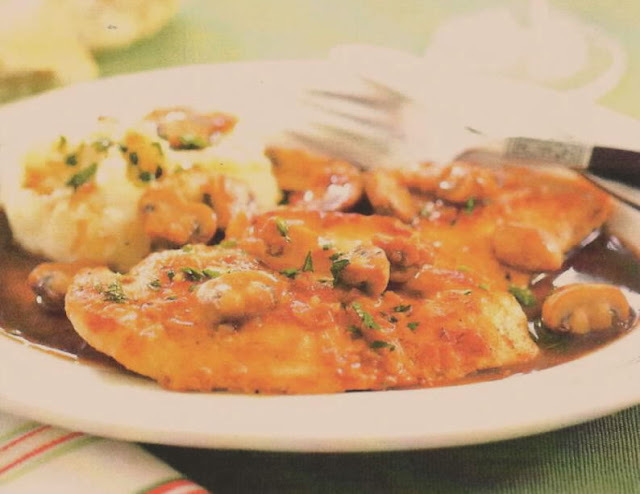 Spoon the mushroom topping over the chicken breasts, garnish with chopped parsley, and serve. Like everyone else, we share a lot of recipes at work. One of my fellow employees brought this wonderful salad for an office party.... needless to say everyone wanted the recipe. I add chicken to this salad and turn it into the main course. Add some warm buns and you've got a great supper!